Dog antibiotics and human antibiotics are, often, one in the same drug. So, in case you’re wondering if you can give your dog some of antibiotics that you happen to have leftover from an earlier illness, here’s what you need to know. Plus, some tips for giving your dog human supplements like Glucosamine, Chondroitin, and Fish Oil. 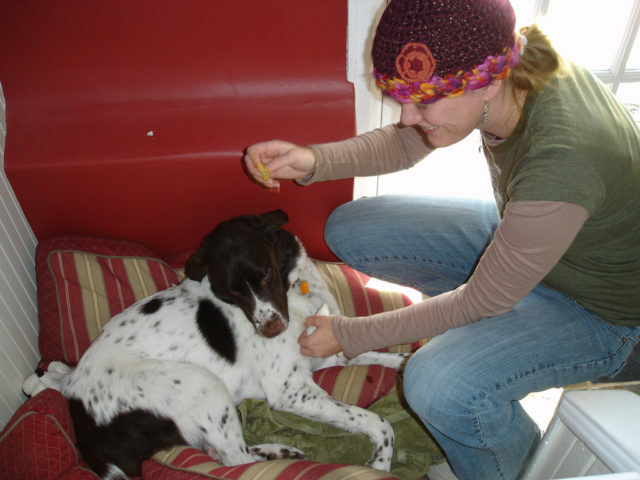 Can Dogs Take Human Medications? Dogs can take some of the same medications that we take as humans, including some antibiotics. However, it’s worth noting that there are some human drugs that can make your dog sick, or even worse, that could possibly kill him. So you always need to check each individual medication first. You can find some of this information online, but for peace of mind you should ask your vet. When it comes to giving your dog antibiotics, just because you have some leftover antibiotics in your medicine cabinet doesn’t mean that you should be giving them to your dog. First of all, antibiotics are a bit different than other medications in that you should always use up the entire package of antibiotics, rather than stop taking them once you feel better. So you really shouldn’t ever have any leftover antibiotics lying around anyway. But if you do happen to have some human antibiotics at home, and it’s well past the expiration date marked on the bottle, please read about the safety of taking expired medications before you use them — for yourself or your dog! As a reminder, be sure to consult your veterinarian (even if it’s just over the phone) before you give your dog any antibiotics that were originally prescribed to you. For starters, you will need to get the correct dosage — based on your dog’s weight and breed. Chances are, the antibiotics that were prescribed to you will be too strong for your dog and would cause him harm if taken in the dose that your doctor originally prescribed for you. A list of antibiotics, anti-fungals, and corticosteriods safe for dogs when used as a topical skin product. If your dog happens to be prescribed the antibiotics Baytril (used for treating bacterial infections like dog ear infections) or Primor (for treating UTI’s and soft tissue infections), you should know that those are both harmful to humans and should only be given to dogs. Here’s a list of commonly prescribed dog antibiotics. Two human supplements that are not safe for dogs are Iron and Zinc. However, let’s say you have osteoarthritis (or other cartilage issues) and you’re taking glucosamine to help with the pain. You may be wondering if your dog can take the same glucosamine to help with his own joint pain. The answer is yes. Human glucosamine and chondroitin are safe for dogs. They are commonly prescribed for dogs with osteoarthritis, hip dysplasia, and spinal disc injuries. Often dogs who’ve had TPLO surgery for a torn ACL will be prescribed glucosamine to help with the knee, hip, or joint pain. For what it’s worth, Cosequin for dogs is one of the most popular options for dog joint pain these days. Can I Give My Dog Human Supplements? Should A Dog On Antibiotics Be Quarantined? There are many over-the-counter medicines that you can give your dog that you take yourself. I myself have given my dog baby aspirin before. My dog hurt her back over the winter. The baby aspirin helped relieve the pain she was feeling. Another good over-the-counter medicine to keep on hand for your dog is Benadryl. One morning I awoke to find my dog’s face was swollen. I’m not sure if she was bitten by a spider or what, but I gave her part of a Benadryl and it helped take the swelling down.